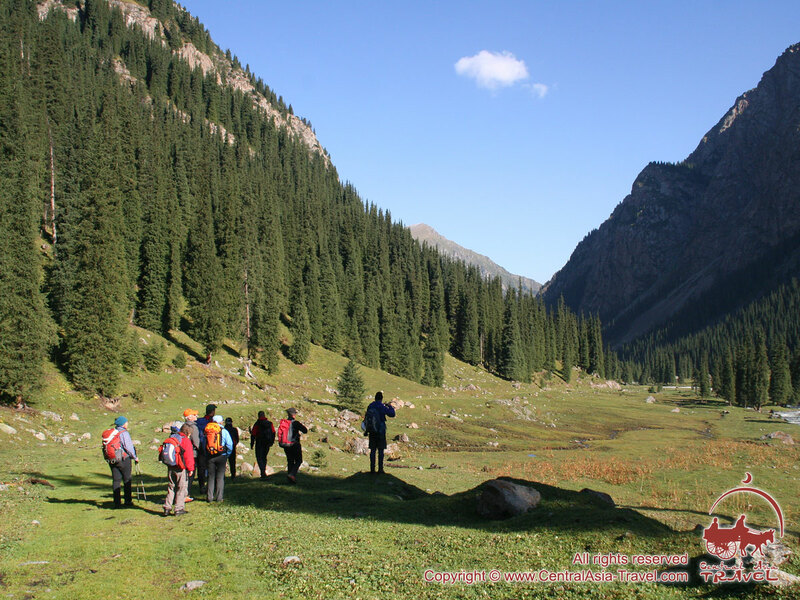 The trekking area lies between the southern shore of the Issyk Kul Lake and the northern slopes of the Terskey Alatau (Ala Too) mountain range (central Tian Shan Mountains). 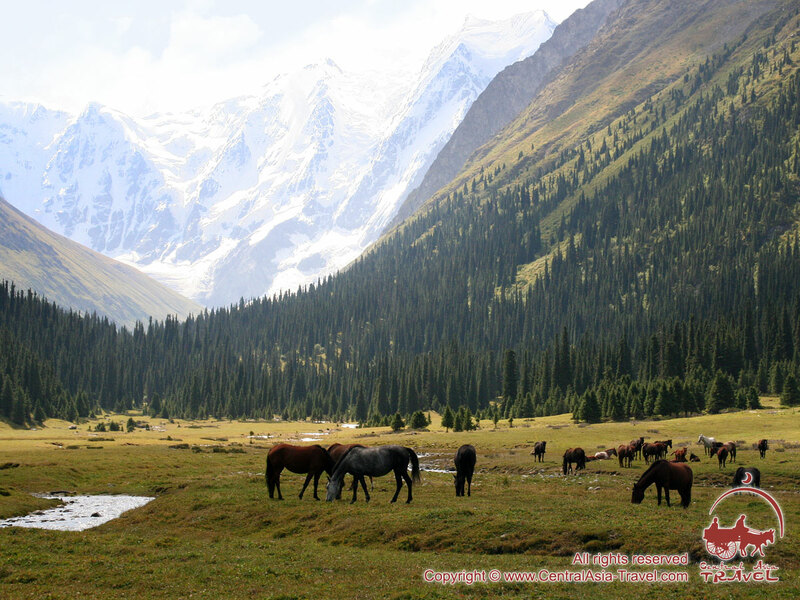 The area belongs to the most beautiful and remote parts of Central Asia. This is the region where beautiful high mountains slope down to the very shore of Issyk Kul, an enormous freshwater Central Asian lake. 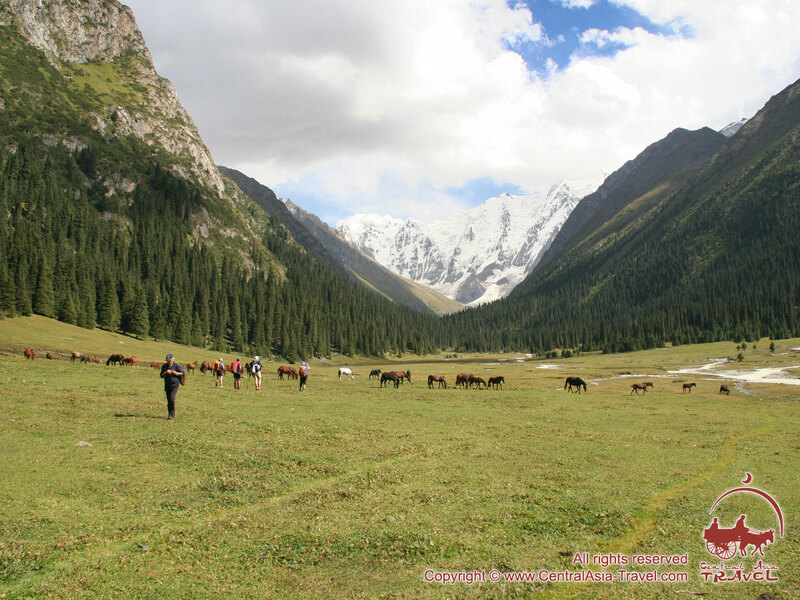 Terskey Alatau Range forms a majestic wall that extends for 340km along the lake’s southern shore, separating this corner of the paradise from the rest of the mountain area with a severe climate. 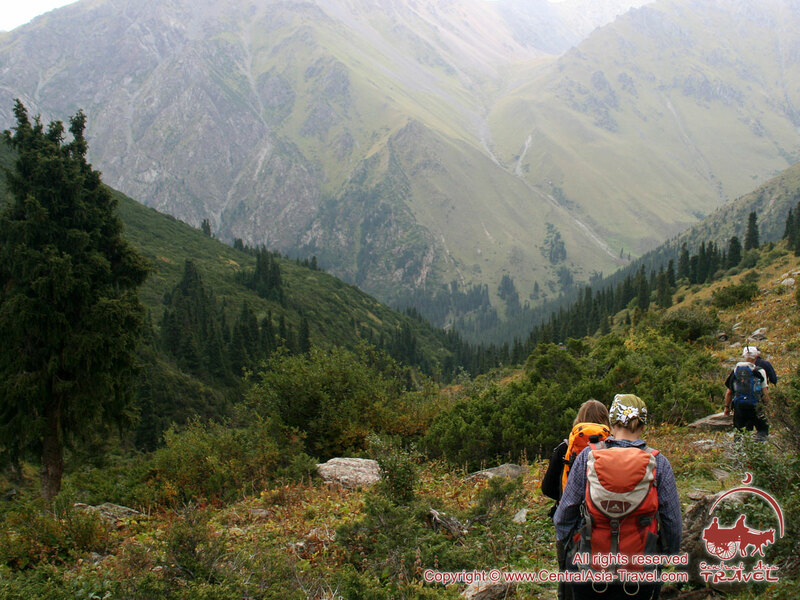 The Terskey Alatau Range with an average altitude of about 4,500m is incredibly beautiful and diverse, its landscapes including pointed snow-capped peaks 5,000m and more in height, wild coniferous forests on the northern slopes, a ridge of red sandy rocks, the Djhety-Oguz, swift rivers and exceptionally delightful gorges. 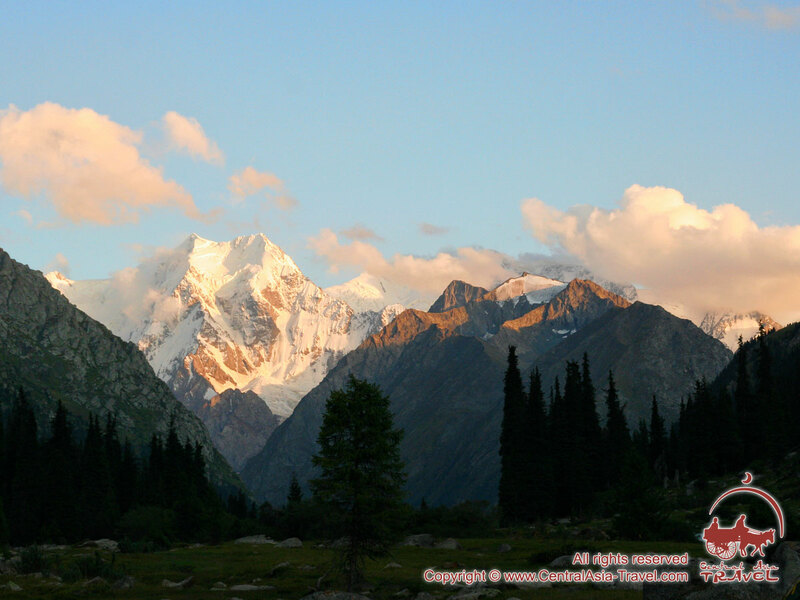 As the trek goes in the immediate proximity to the highest part of the range, the trekker has a unique opportunity to continuously enjoy the views of its immense and severe peaks: Karakol Peak (5,218m), Djhety-Oguz Peak (5,181m), Djhigit Peak (5,172m) and Aksu Peak (5,020m). Travellers will immerse in the freshness of fragrant fir forests and experience the healing effects of hot mineral springs (Djhialisu, Altin-Arashan). 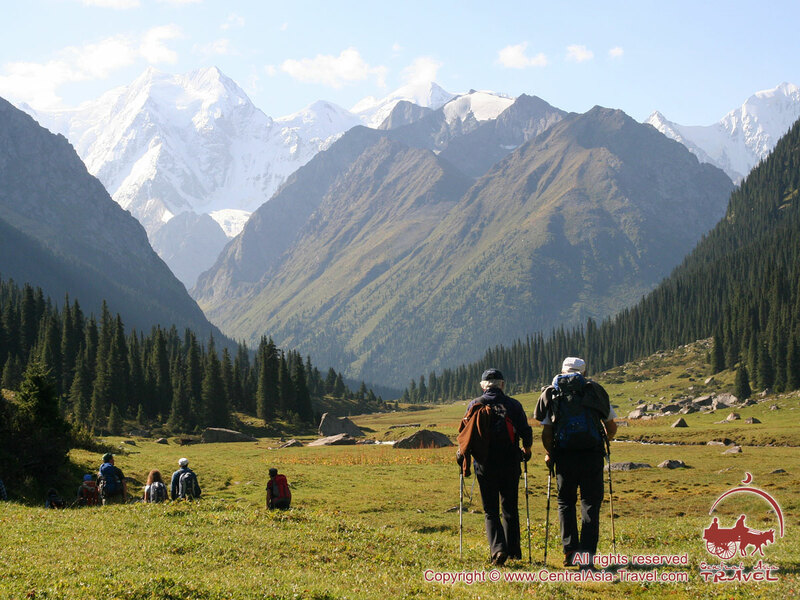 Tourists will get to know the harsh beauty of nature during the round day trips to the foot of great summits. 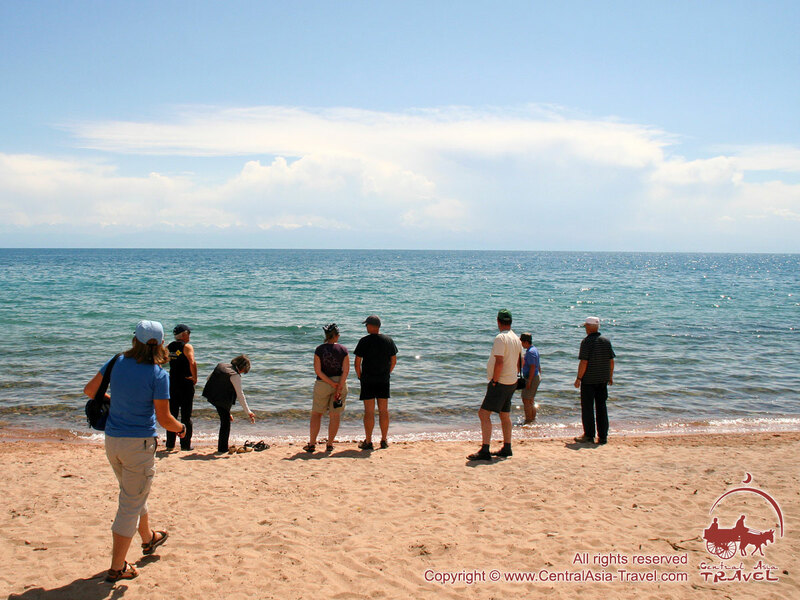 At the end of the tour you will spend a couple of days on the warm sandy shore of famous Lake Issyk Kul. 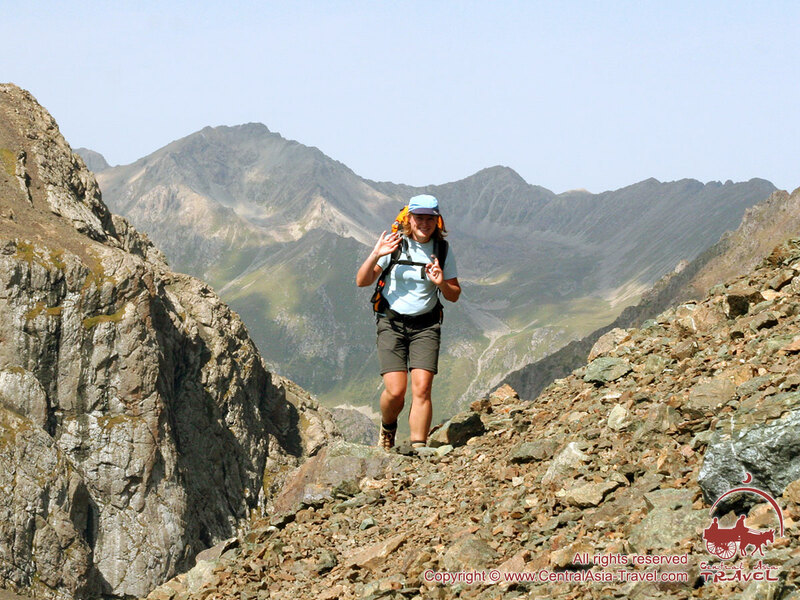 Best time for trekking is from July to September. Day 1. Arrival in Bishkek. Sightseeing tour around Bishkek. Meeting at “Manas” airport. Transfer to Bishkek (30 km), check-in at hotel. Sightseeing tour around Bishkek: the central Ala-Too Square, Historical Museum, National hero Manas Monument, Kurmanzhan Datka Monument, Old Square with Parliament House, Victory Square. Overnight at the hotel. Day 2. 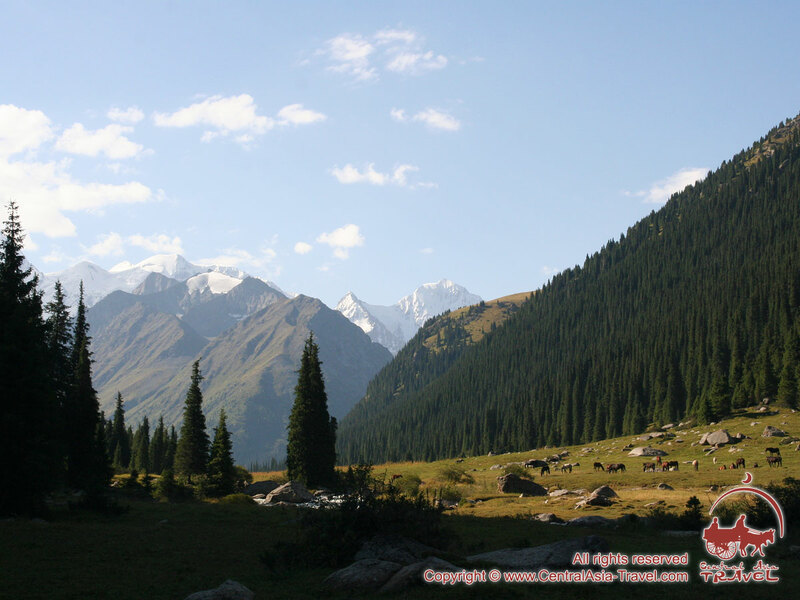 Transfer by bus from Bishkek to the Karakol. Gradually gaining altitude, we drive along the fertile oasis of Chu River valley - once part of Great Silk Route travelled by merchants as well as hordes of Mongols of Genghis Khan (13th century AD) and armies of ruthless emperor Tamerlane (14th century AD). On our way we pass major towns Tokmok and ruins of Burana Tower (old minaret). Lunch en route. 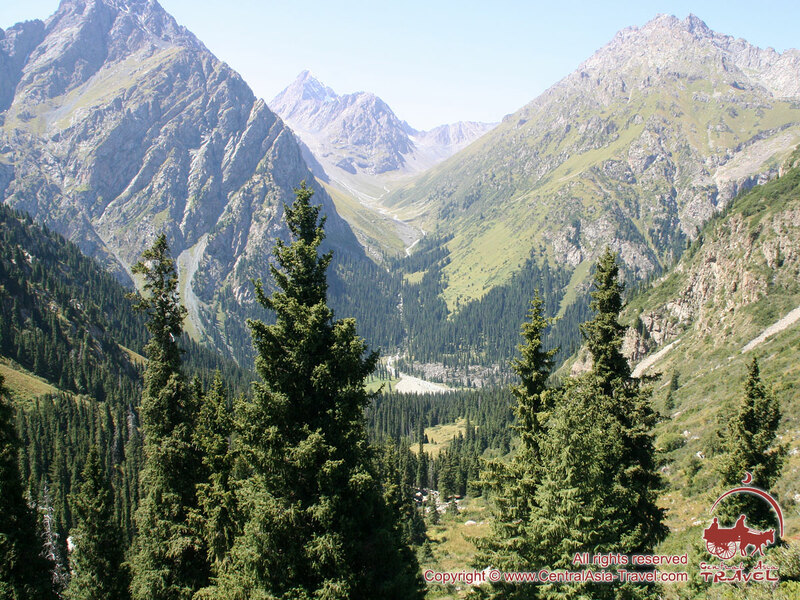 The road winds into the picturesque narrow Boom gorge (“shoelace” in Kyzgyz) and, halfway to Karakol, reaches Balykchi where Lake Issyk Kul (“warm lake” in Kyrgyz) starts from - a natural wonder of Central Asia. 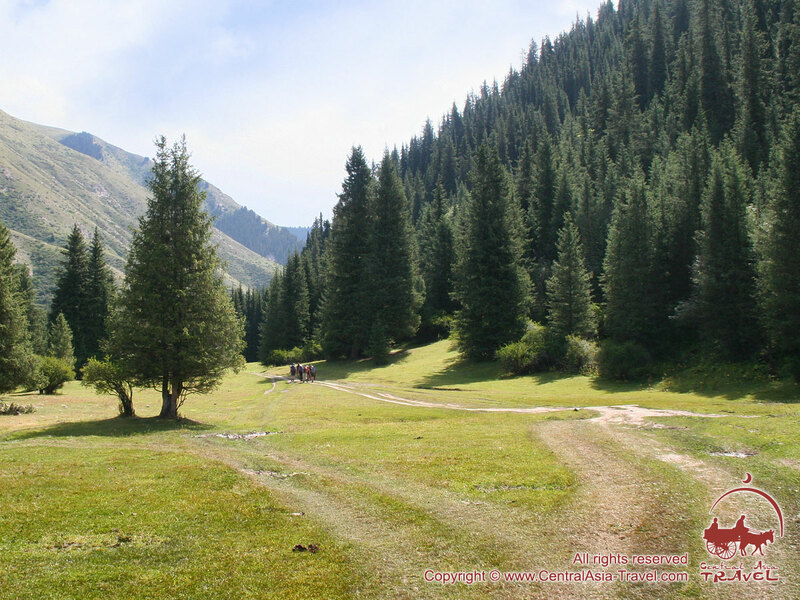 The town of Karakol (population of 65,000) is set 8km away of the Lake Issyk Kul. Abundance of rains and deep mountain streams bring here a lot of water and make local climate extremely favourable for agriculture farming and cattle breeding. That is why the streets of the town are drawn in impressively thick and tall poplars as well as apricot, cherry, pear and apple trees. Local bazaars attract with its mix of Chinese, Dungan, Uighur and Russian faces and a diversity of local fruits and vegetables. Day 3. 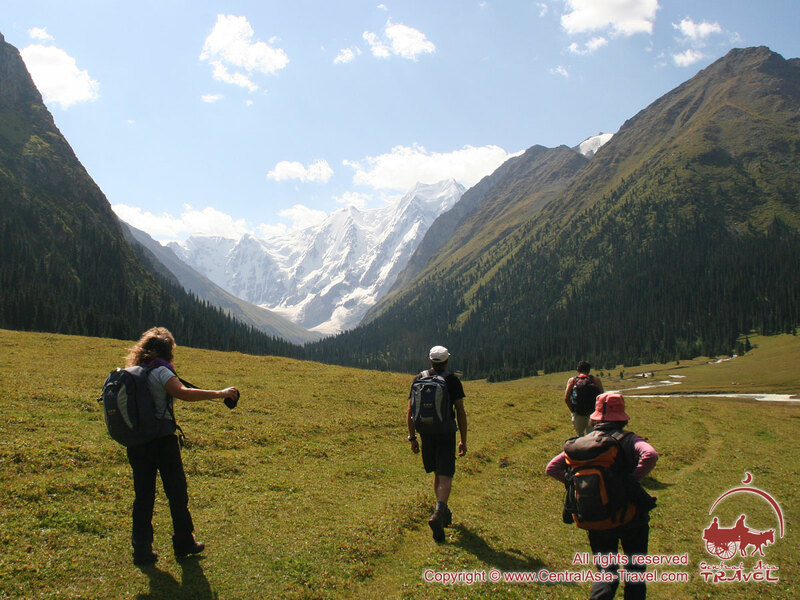 Sightseeing tour around Karakol. 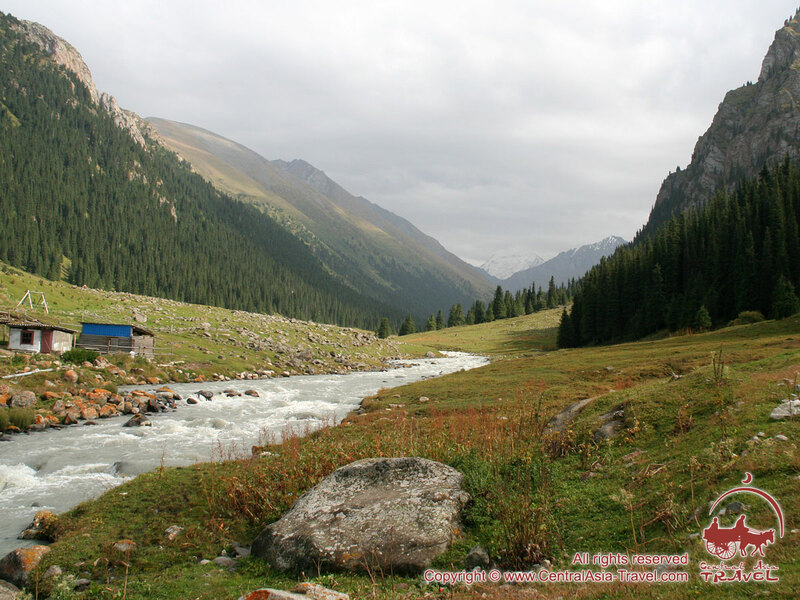 Transfer by truck to the valley of Djhety-Oguz river . Distance: 45 km, 1-1,5 h; Altitude difference: +900 m.
Sightseeing tour around Karakol: a wooden Orthodox Russian church and impressive wooden Dungan mosque, Prjevalskii Memorial Complex. Lunch in a local café. 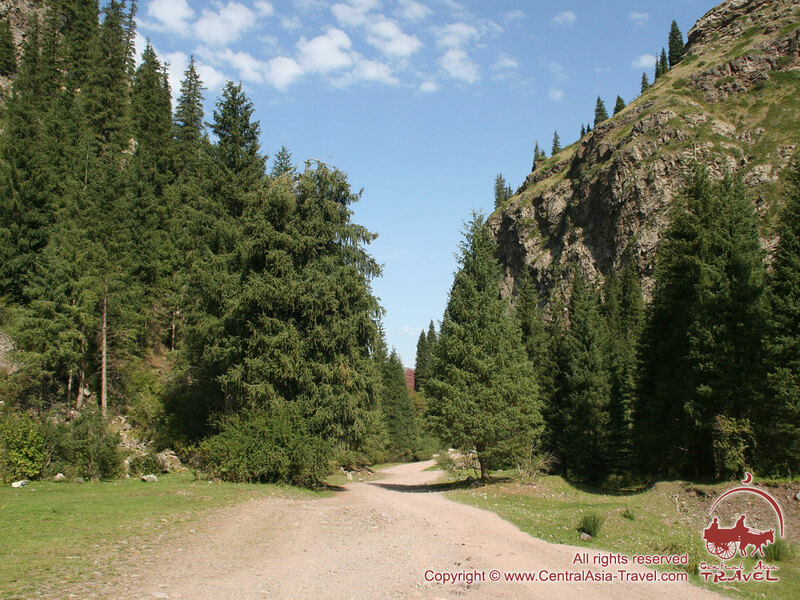 Transfer to Djety Oguz gorge located in the Northern slopes of Terskei Ala Too some 15km west from Karakol town. Here we can see an unusual formation of red sandstone cliffs that gave the place its name - Seven Bulls. 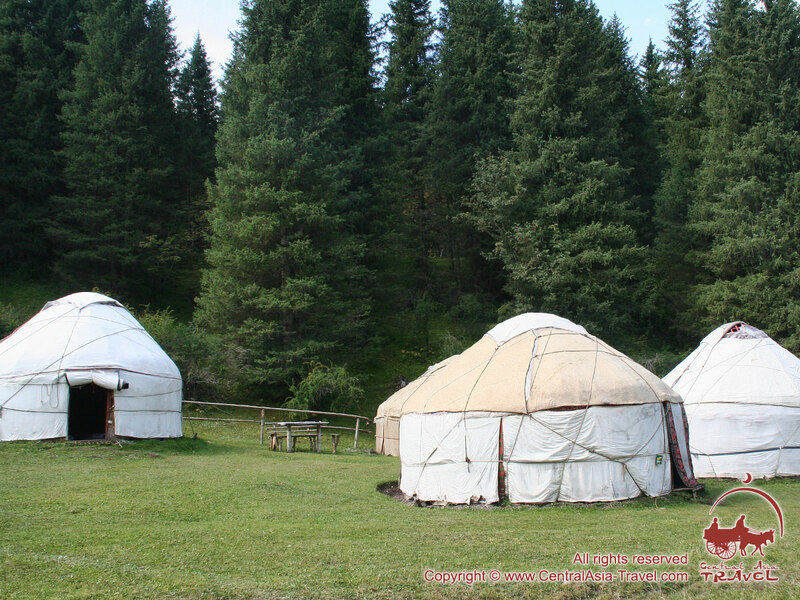 Dinner and overnight at the yurt camp "Djhety-Oguz". Day 4. 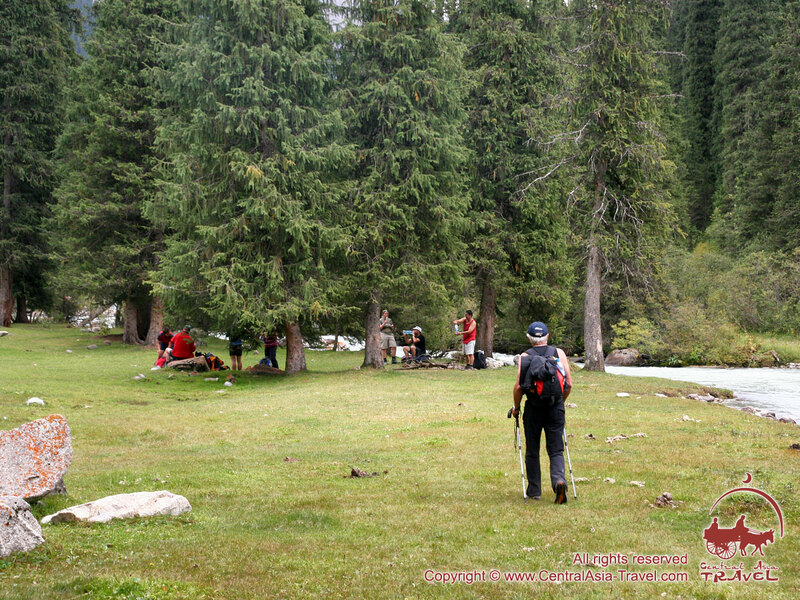 Trek to the foot of Telety pass. 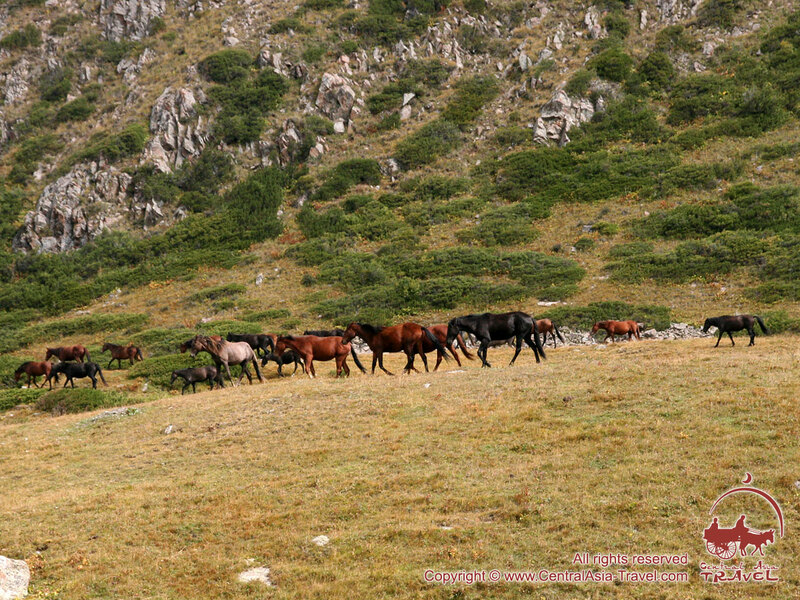 Distance: 16 km, 6-8 h; Altitude difference: +450 m.
We sort out our loads to be carried on horses and proceed with trekking. 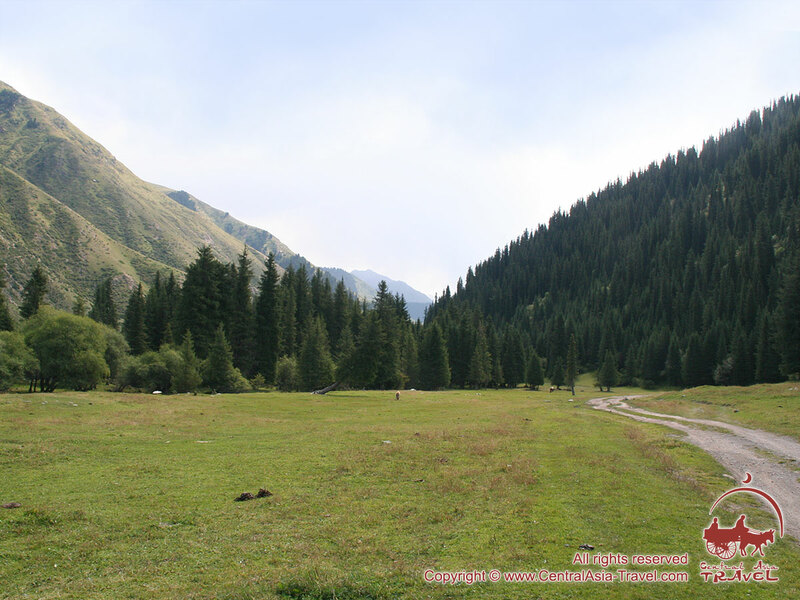 We trek a short way until turning left at the confluence of Djheti Oguz and Telety rivers to carry on by a good path on the orographically left hand side of a beautiful valley along the Telety river through the fir forest. One hour past we reach the confluence of Ayutor River and Telety River. We can see Archaly Peak at our front. 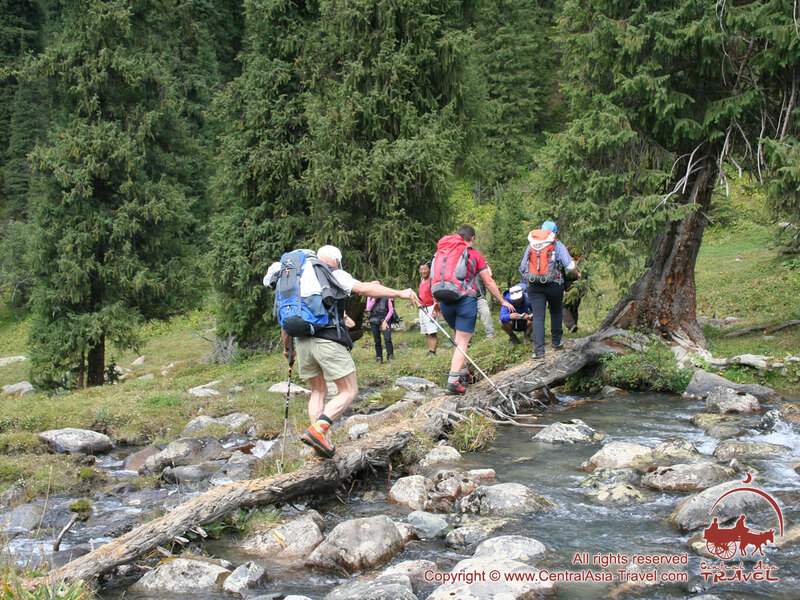 Two hours on we cross the Telety river over a log bridge and start ascending on rather steep trail winding up on the mountain spur through a thicket of juniper shrubs. After lunch we ascend rather steeply approximately 400 metres to our camp. On the way we enjoy views of the picturesque valley. 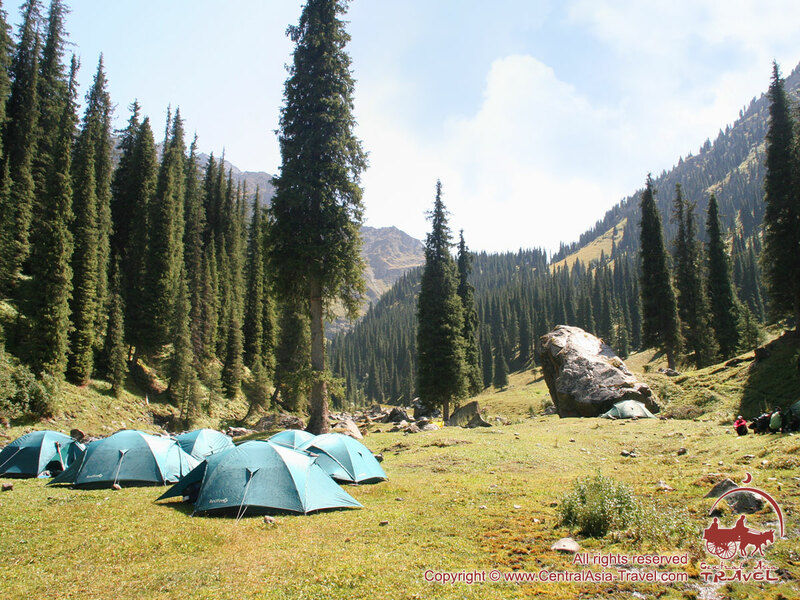 Camp is situated near small waterfall on the nice grassy spot in the packet between the neighbouring mountain spurs protecting out tents against strong highland wind. 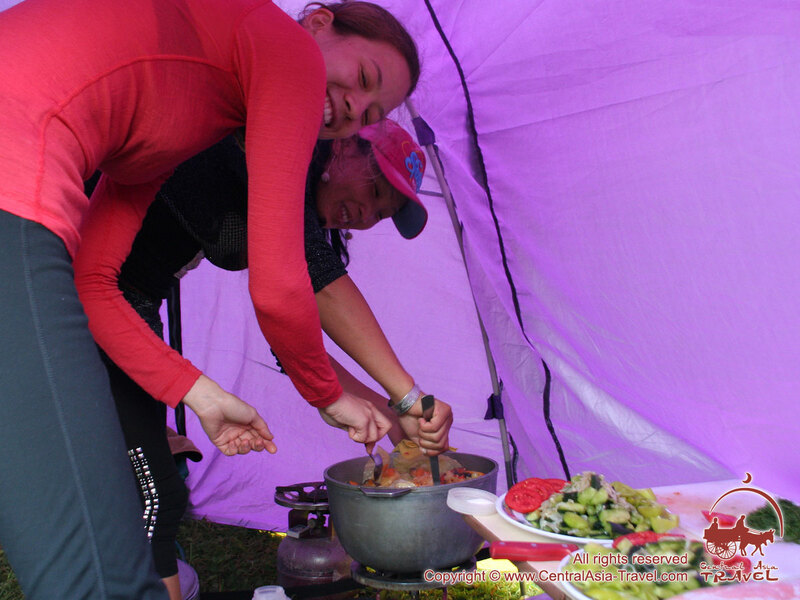 Dinner and overnight in “Telety” tent camp at 3050m. Day 5. 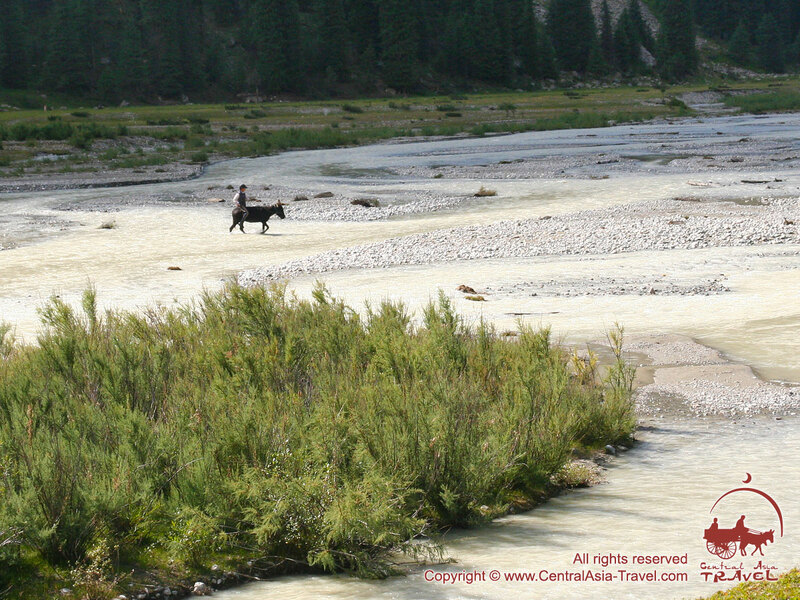 Cross over Telety pass (3800 m) down to the Karakol River (2300 m). We are awoken by whistles of eagles and marmots. It takes us 15 minutes to reach ancient moraine which we bypass on the right. Air is thickened with omnipresent sparrows and daws soaring around. Eagles and lammergeiers are patrolling the area hovering on the updrafts. We ascend on a good stony path - good for people and poor for horses. Two hours past the trail levels and we see the circ - cliffy and scree terrain - from where the pass becomes visible. These are rugged mountains and the views spectacular all around. 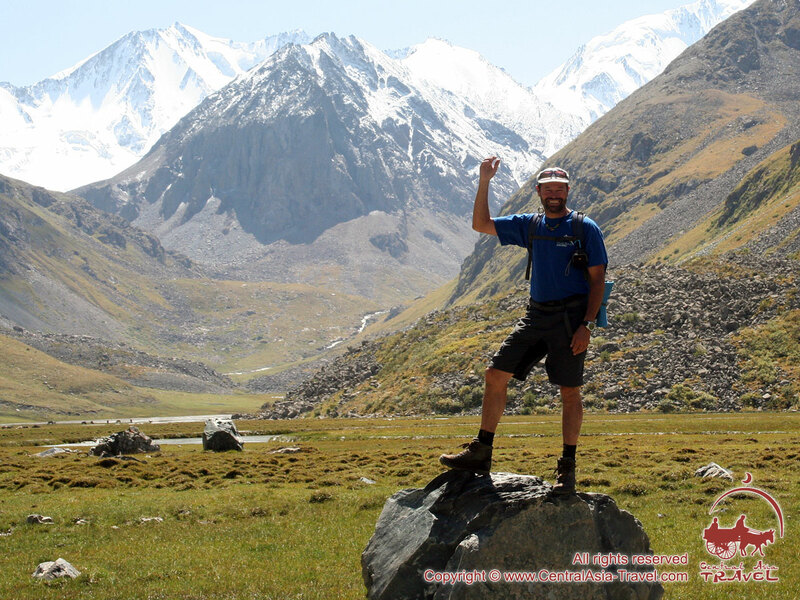 To the other side of the pass is the Karakol valley, and our route now takes us down valley. First the trail goes down on the stiff rocky terrain. Then it levels into green grassy spot, bypasses coarse-stone scree and runs down the mountain stream that is forded twice. Past first confluence (right hand side lateral) the trail reaches marshy glade covered in mountain garlic. We cross the stream here and follow the trail running on the left bank of the stream - a herder’s trail through juniper shrubs. After lunch we carry on downhill on the alpine meadows till thick fir, spruce, larch and ash forest. 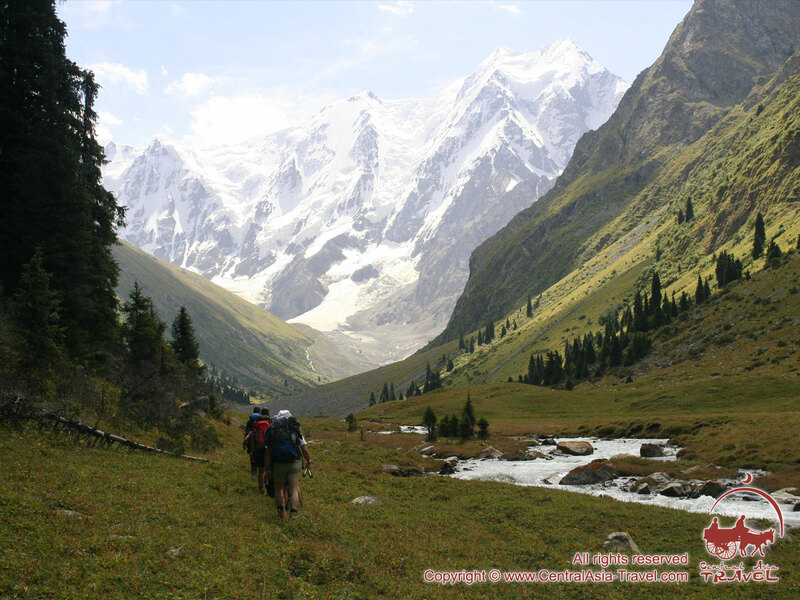 There from we clearly hear rumbling of Karakol River flowing down at the bottom of the valley - we are close to our camp now. 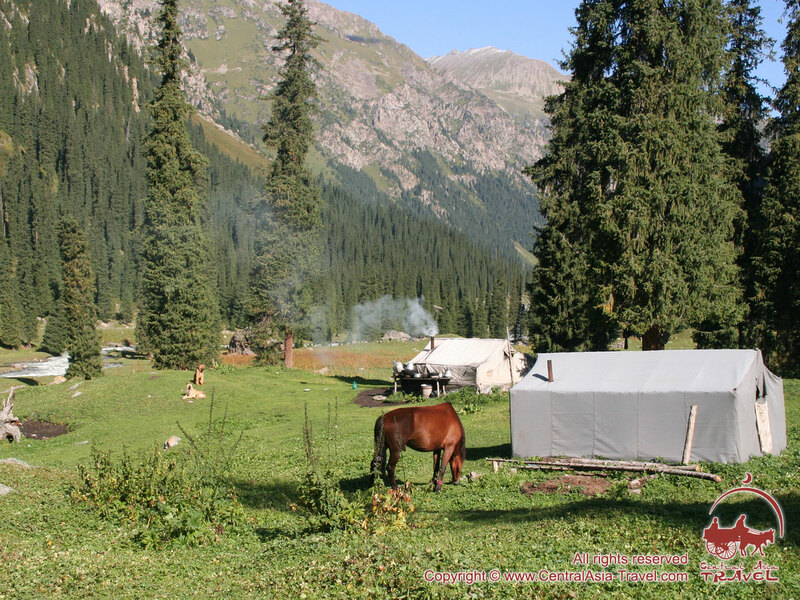 Camp (2600m) in the upper reaches of Karakol River valley is on the river bank near big bolder. Terrain around bears traces of human deforestation activity. 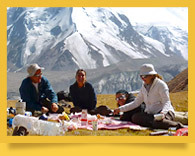 Dinner and overnight in “Karakol” tent camp at 2500m. Day 6. 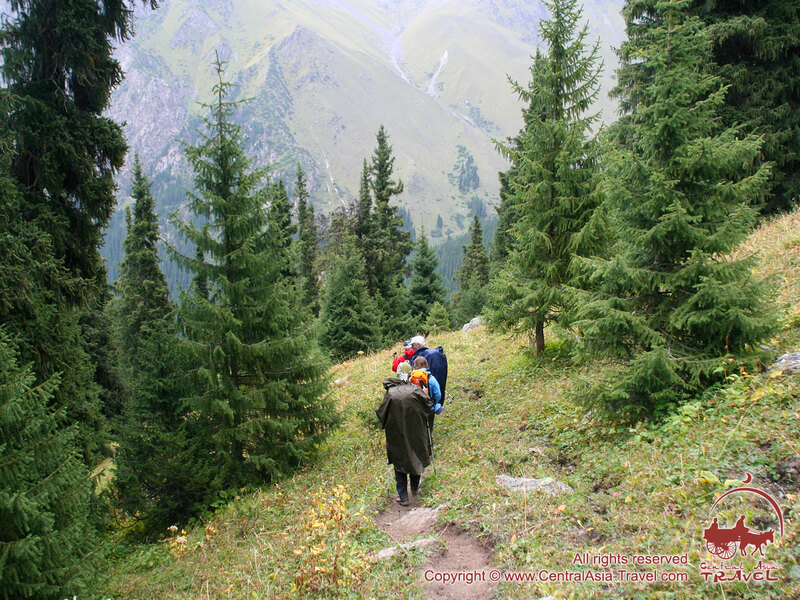 Radial hike to the foot of Karakol peak (5216m). Distance: 16km. 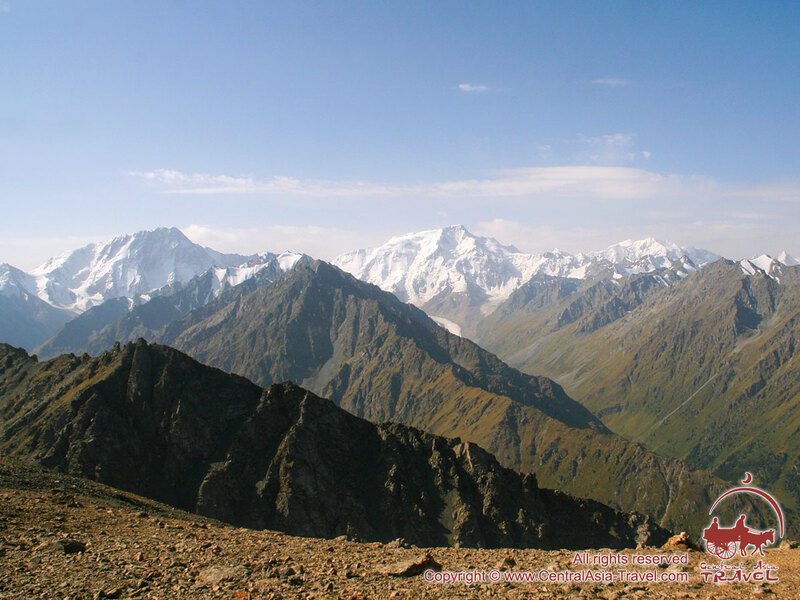 6-8 h; Altitude difference: +700 m /-700 m.
We trek up valley and in one hour past reach a large rock presenting memorial plates set to those mountaineers who perished on the most challenging sheer walls of Karakol Peak and Djigit Peak. We head than out of the tall fir forest and above the river to green meadows blanketed in flowers - poppies, daises, pansies, calendulas, jointweeds, mallows, motherworts - and clumps of juniper bushes. 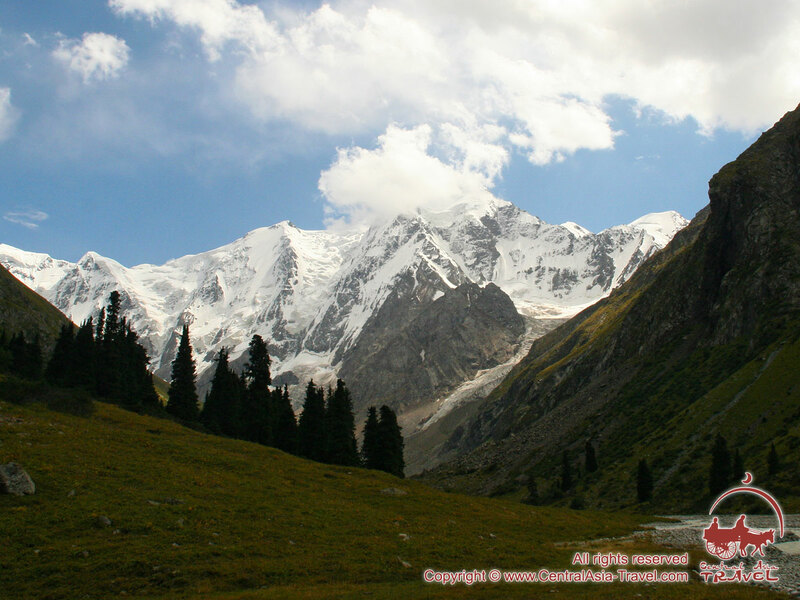 Just past the forest a view opens up to Karakol Peak - a white trapeze face adorned in hanging glaciers. The trail runs on a grassy slope to the top of the natural dam where small lake lies followed, further up, by the other bigger one. 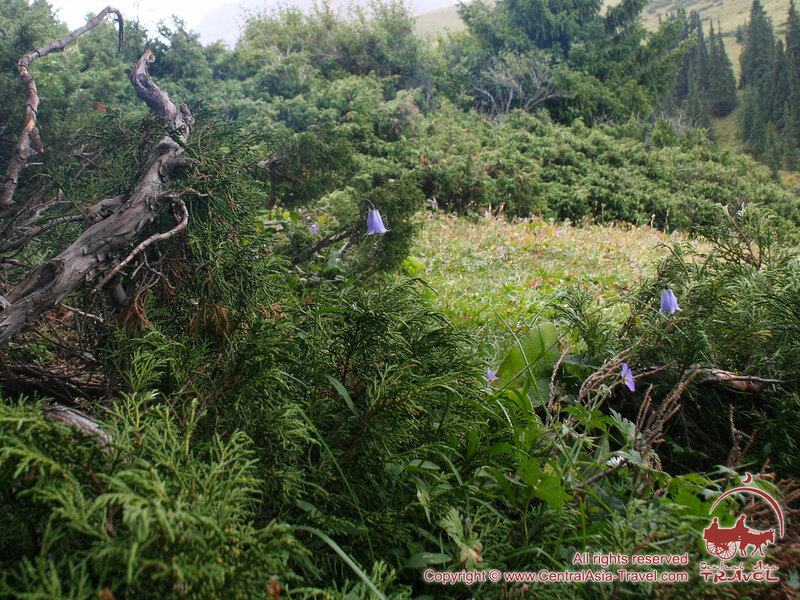 Here on alpine meadows Pink Roseola grows - an herb the roots of which possess curing properties similar to ginseng. 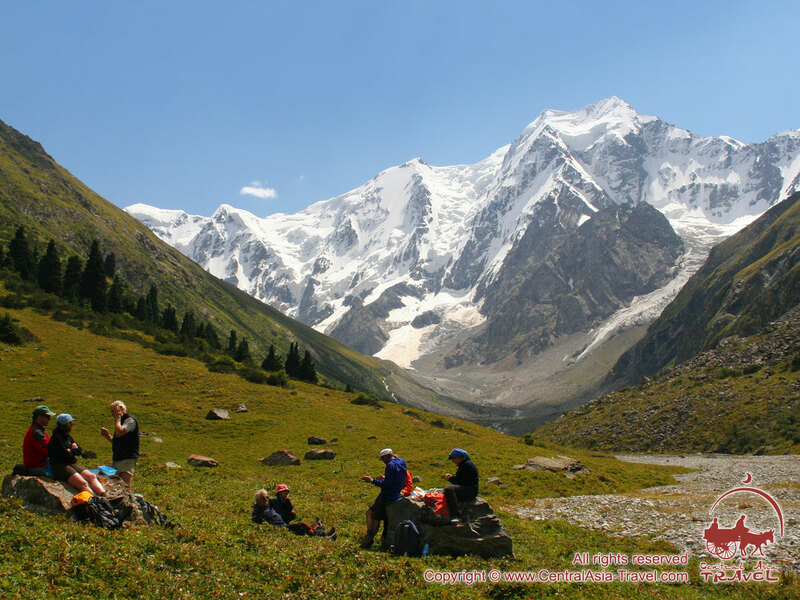 The lure is not just to picnic beside the mountain stream, but to appreciate the grandeur of Djigit Peak (5170m) which commands a presence over the left hand side of the valley. We can also enjoy a view of the Hair Waterfall (on the right). After a picnic lunch we return back to our camp. 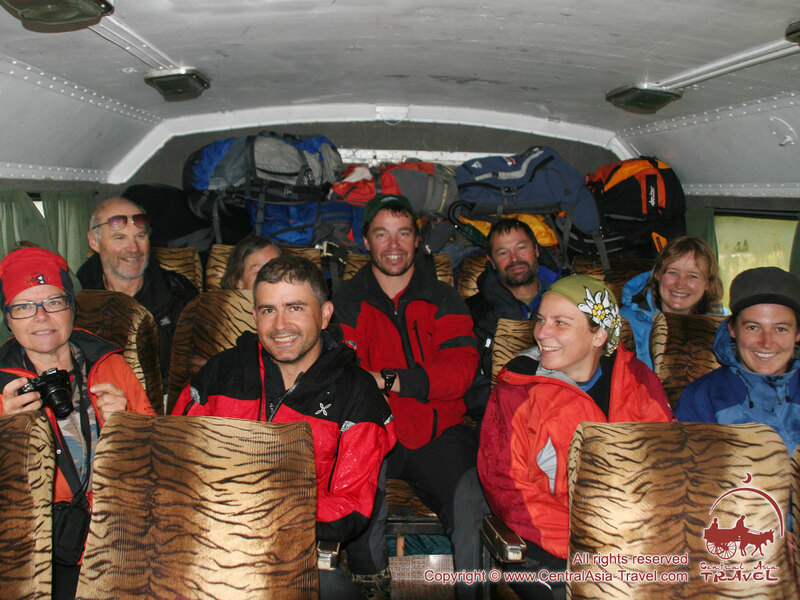 Dinner and overnight in “Karakol” tent camp at 2600m. Day 7. 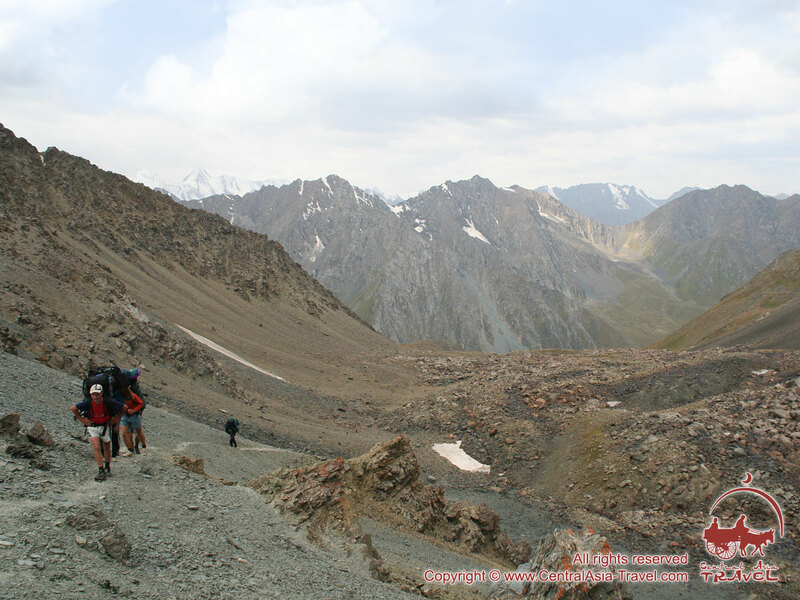 Ascend from Karakol river up to Alakul Lake (3532 m). Distance: 9 km, 6-8 h; Altitude difference: +1100 m.
Moving on now, we trek first down valley along a good road for a short while and, past mountaineering camp site, cross over a foot bridge into the thick forest. 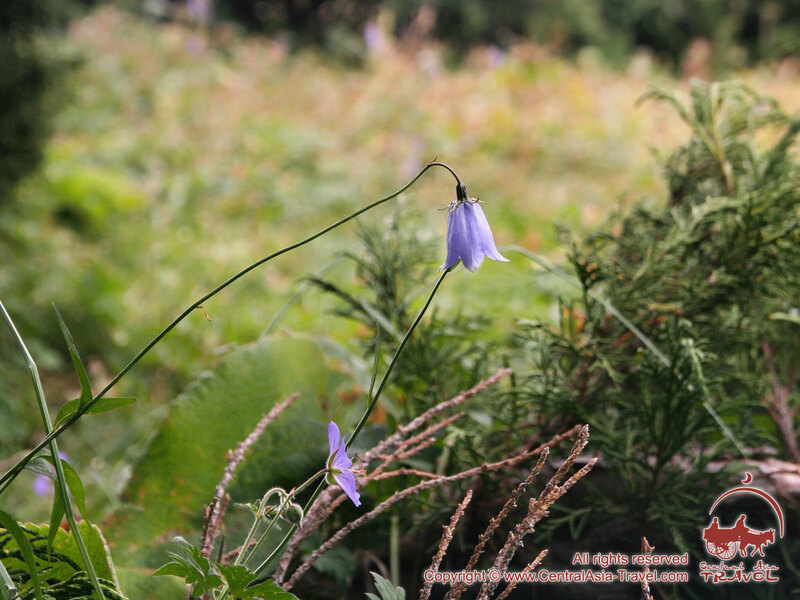 We follow a narrow winding trail upwards and soon get into open slopes of grasses and shrubs. We enjoy picturesque views across to adjacent valleys. 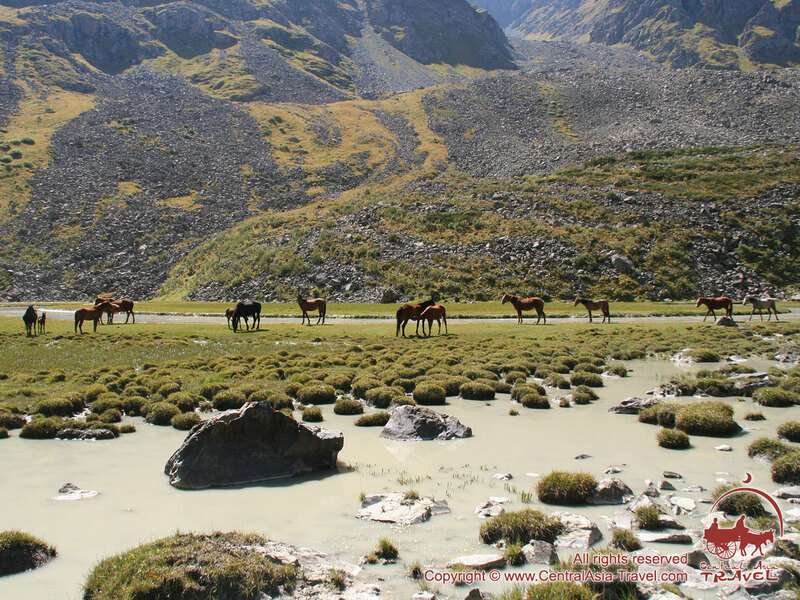 We reach a small blue lake where we may take a picnic lunch and then trek on through the forest to a place where a climbers hut is located (2600m). 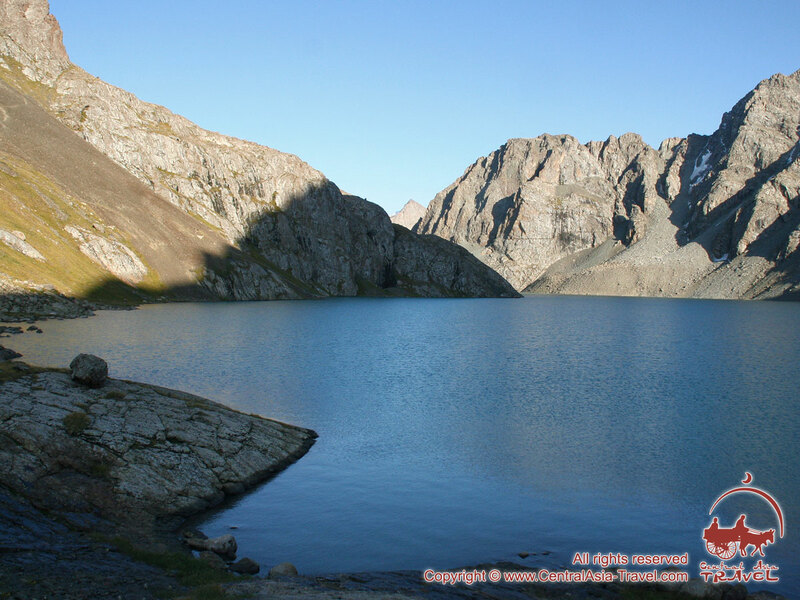 We may set camp here, or trek on up for another two or three hours beside alpine stream and scree and boulders to a higher camp on the shoulder of the expansive azure blue Alakul Lake at approx 3200m. This will depend on logistic and weather conditions, and decision will be made by your group leader. Camp at 2600m in the green zone provides more warmth and comfort compared to camping at 3200m on the small rocky spot in the windy narrow bottleneck where the stream overflows the lake. 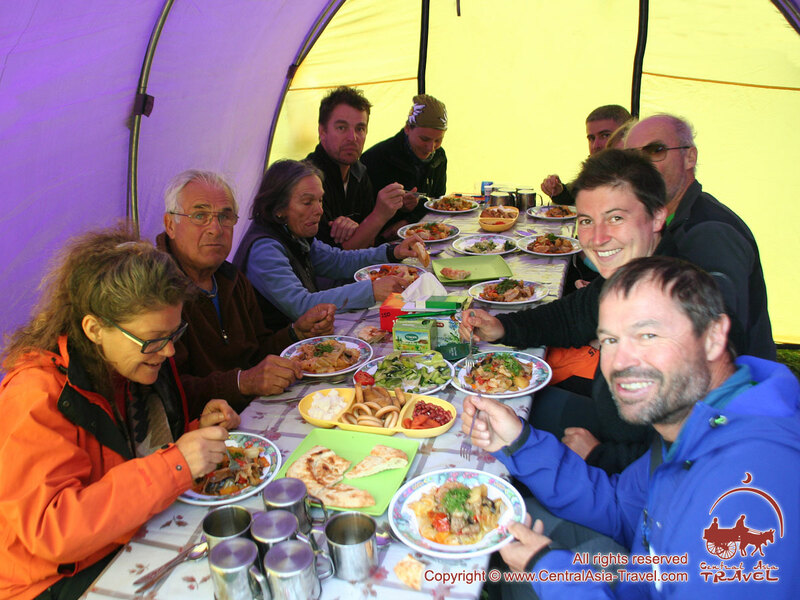 Dinner and overnight in “Ala Kol” tent camp at 3200m. Day 8. 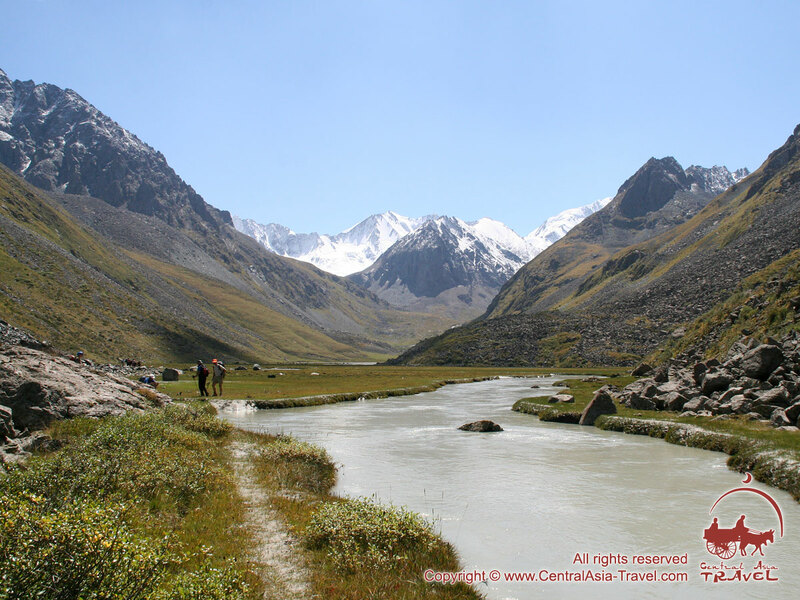 Trekking over Ala Kol pass (3800m) passing Ala Kol Lake and descend to Arashan gorge (2600 m). Distance: 18 km, 6-8 h; Altitude difference: +200 m/-1200 m.
We gain altitude moving along the trail running up and down the scree-rocky slope. We keep the lake on our right. The turquoise-blue lake stretches as far as the eye can see, and peaks and glaciers of the Terskey Alatau range (among which the 4900m-high Ekichat Peak is clearly distinguishing) provide the backdrop for the entire panorama. 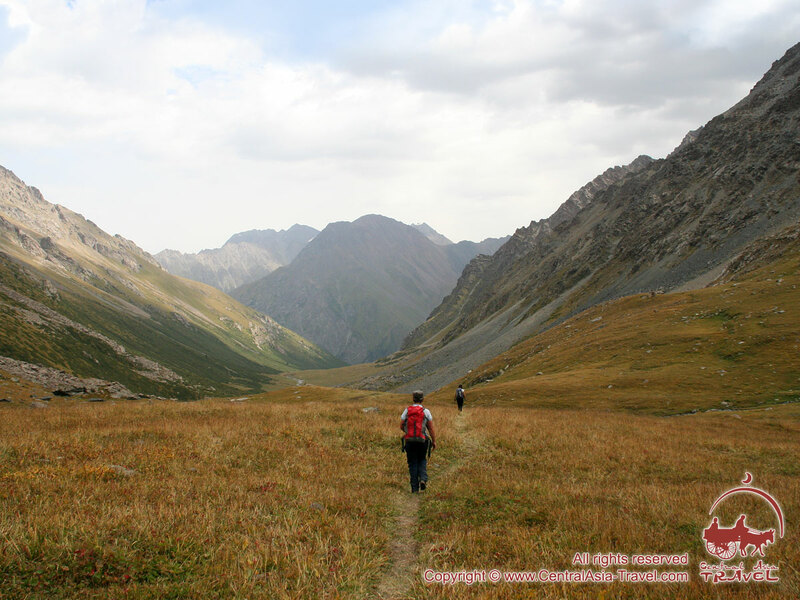 The climate is much cooler now and warm clothing, hat, gloves and waterproofs are essential items to have with you whilst in this locality through to the other side of Alakul pass. Nonetheless, it makes sense to top up your water bottles as there will be no sources of water till we cross over. It may take us up to 3-4 hours from the lake to top the pass. The views across to the Terskey Alatau span kilometre after kilometre. Looking to the south from the top we can see Djigit Peak (5170m) on the left and Karakol Peak (5281m) in the middle. The view of Alakul Lake is unmatched. After photos we commence our descent to the Arashan Valley. 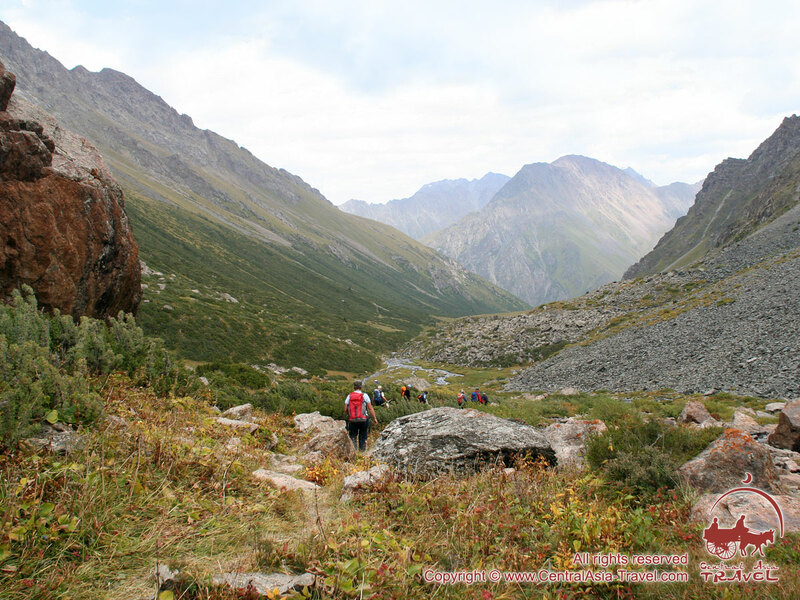 The trail first follows on the scree into alpine meadow zone of Kurgantor River fed by glaciers and down to forest of the main valley of Arashan River. It may take us 2-3 hours to reach to the bottom of the valley. 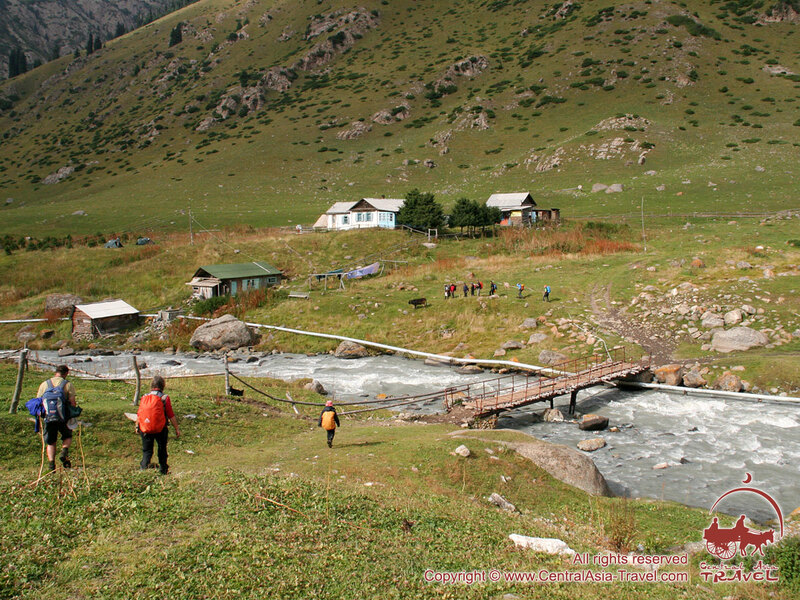 We camp at Altyn Arashan hot springs. This place is very popular with local Kyrgyz visitors looking for opportunity to heal their body/muscle/joint-related illnesses by dipping in hot springs. Possibility to take thermal baths (up to +50C). 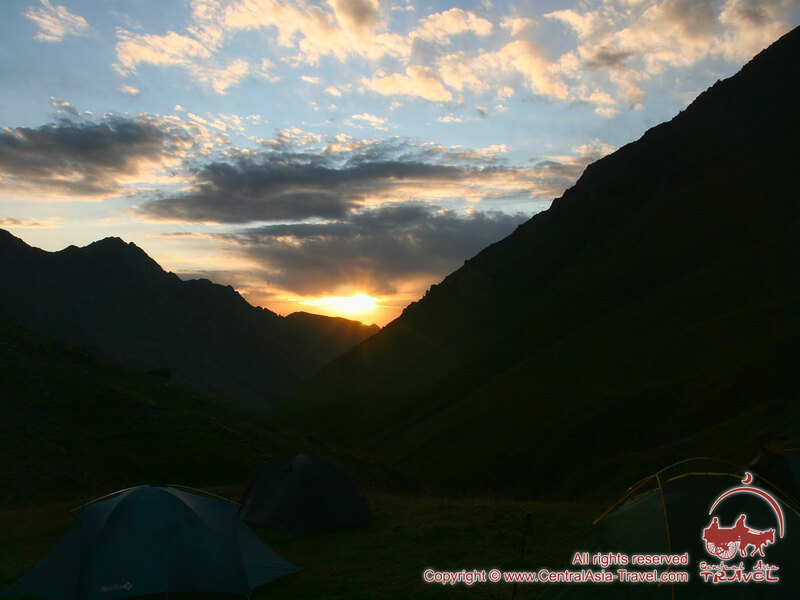 Dinner and overnight in “Altyn Arashan” tent camp at 2600m. Day 9. 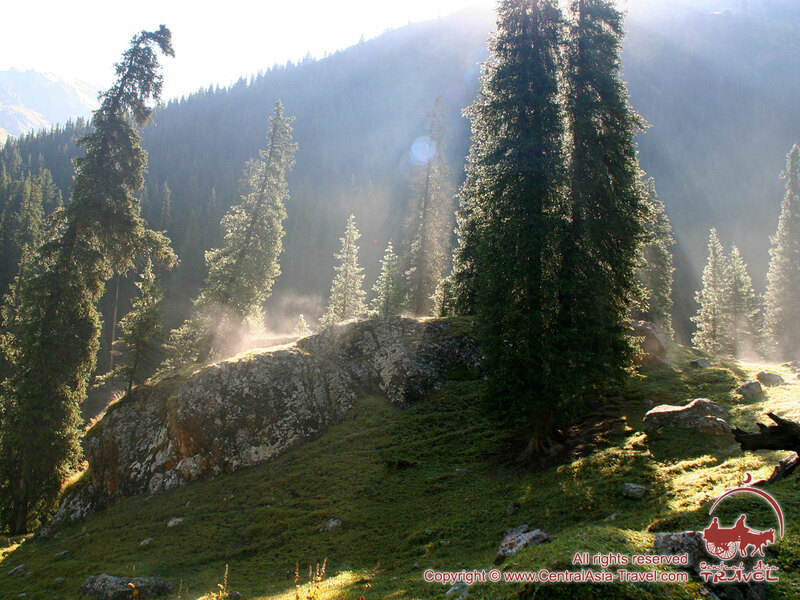 Altyn Arashan gorge - Cholpon Ata town. 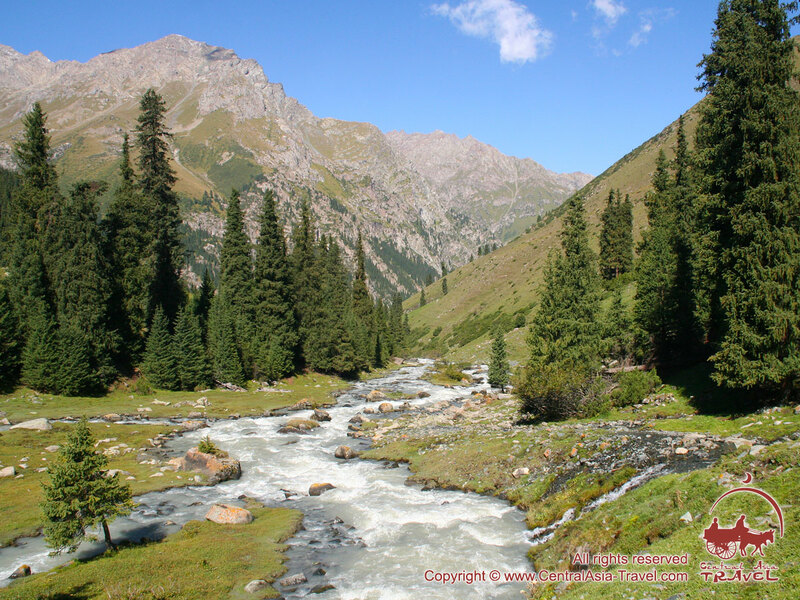 Distance: 155 km, 4-5 h; Altitude difference: -1000 m.
Next morning once everyone is loaded on the truck we head downstream alongside of Altyn Arashan river through thicket of fir forest back to Karakol city. 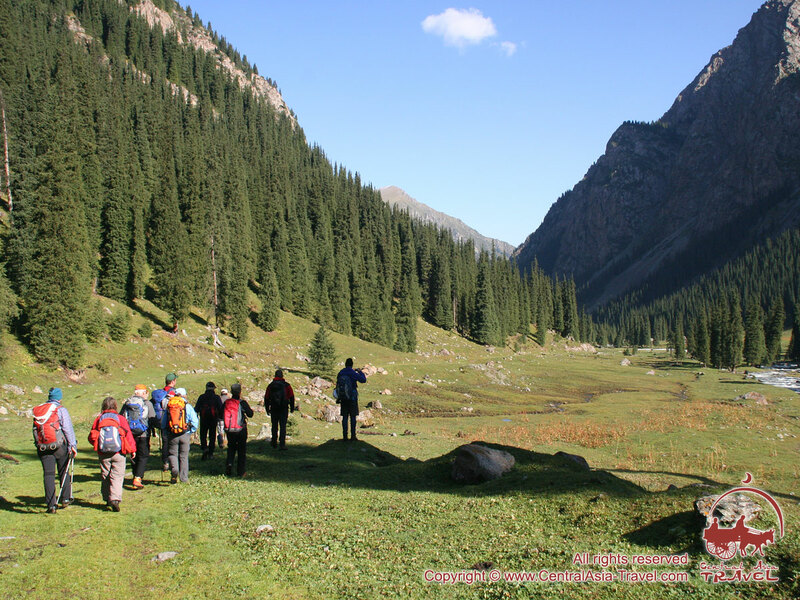 We change vehicle, explore local bazaar and lunch there in Karakol. 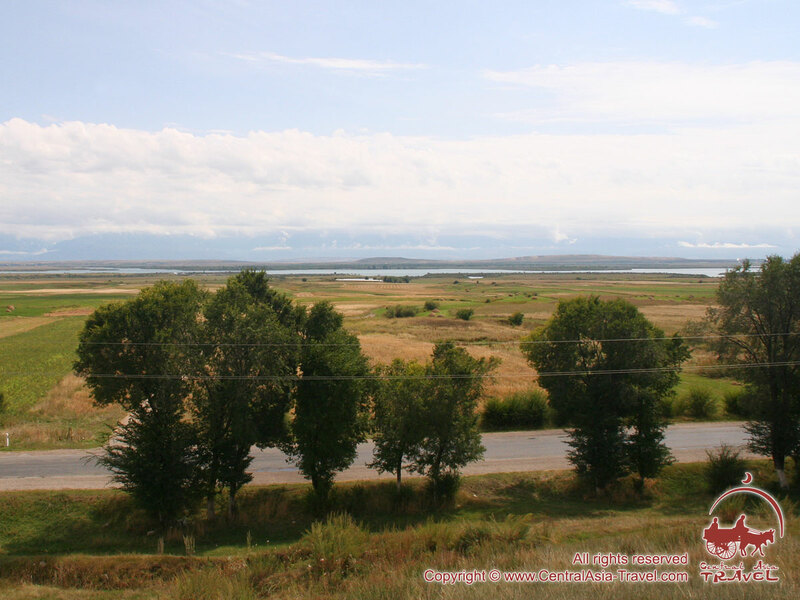 Then we carry on to Cholpon-Ata driving alongside of the northern shore of Issyk Kul Lake enjoying the views of Terskey Alatoo Range (south) and Kungey Alatoo Range (north). We end up the day in Cholpon-Ata - a 40 000-population big town and unofficial centre of resort area of Issyk Kul Lake where all spectrum of sanatoriums and rest houses is available. Day 10. Transfer Cholpon Ata - Bishkek. Distance: 250 km, 3-4 h; Altitude difference: -800 m.
Those champions of early morning swimming can have a bath in the lake. 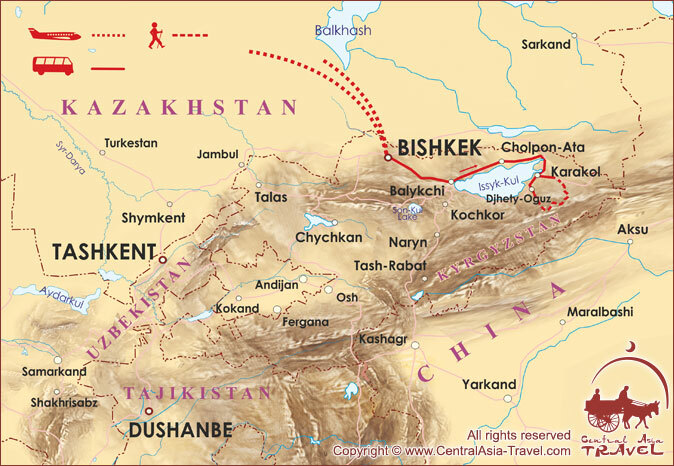 And after breakfast we set off to Bishkek. In one hour or so we are in Balykchi, past which we are back on the road we were arriving by here - two weeks ago! We lunch on the way in a sideroad café. We arrive in Bishkek in the afternoon having enough time to explore more of the town, or to do last minute purchase, or simply to take shower and relax before dinner. Day 11. Transfer to airport. Departure. Depending on your departure time you will be provided with a vehicle that, after breakfast, will take you to Manas airport or to Bishkek railway station where you will be seen off by our local guide. 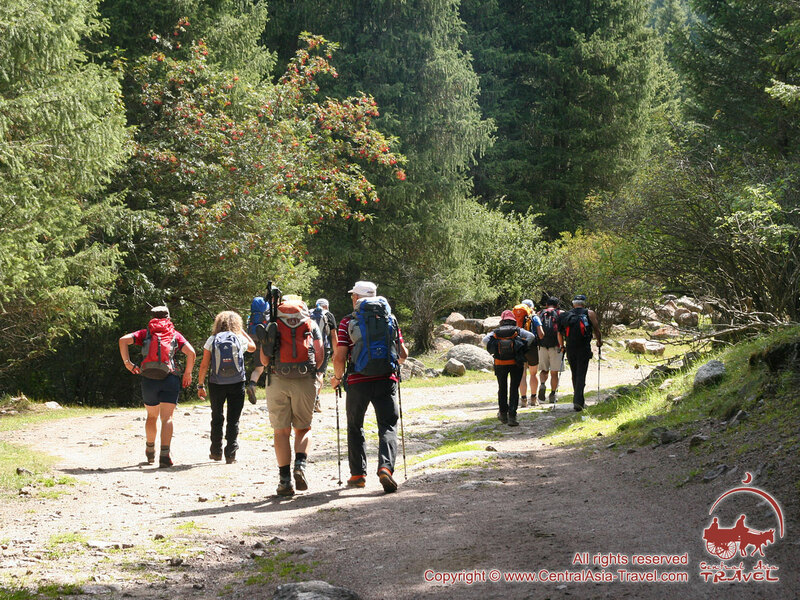 This trekking is rather easy and is suitable for anyone with good physical condition. 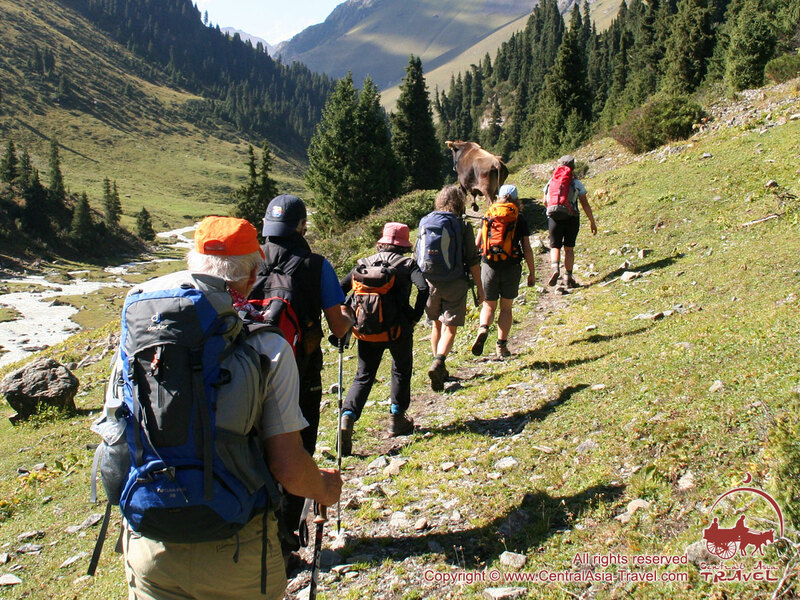 Tourist above 16 and under 65 years of age can join this tour provided they have no serious health problems and their doctor does not object to participation in such kind of tourist activities. 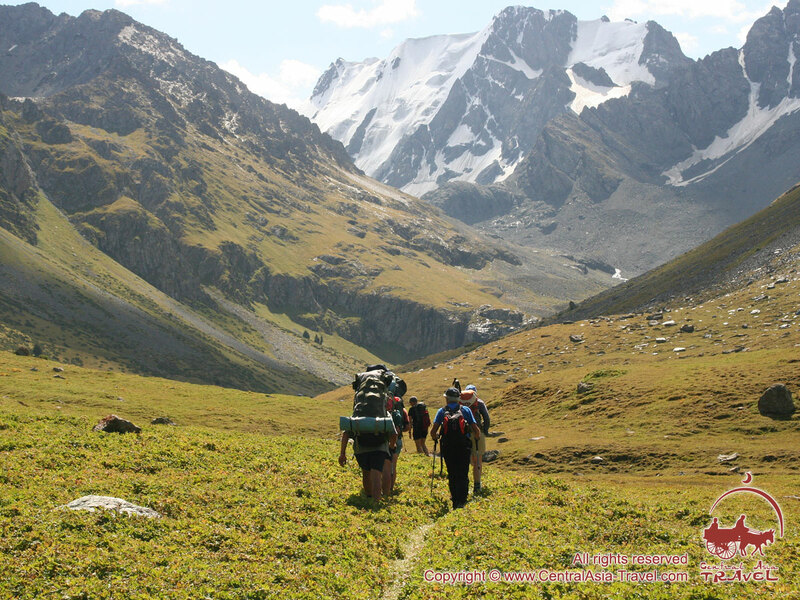 Children above 14 can also join this trekking tour provided they are accompanied by their parents. 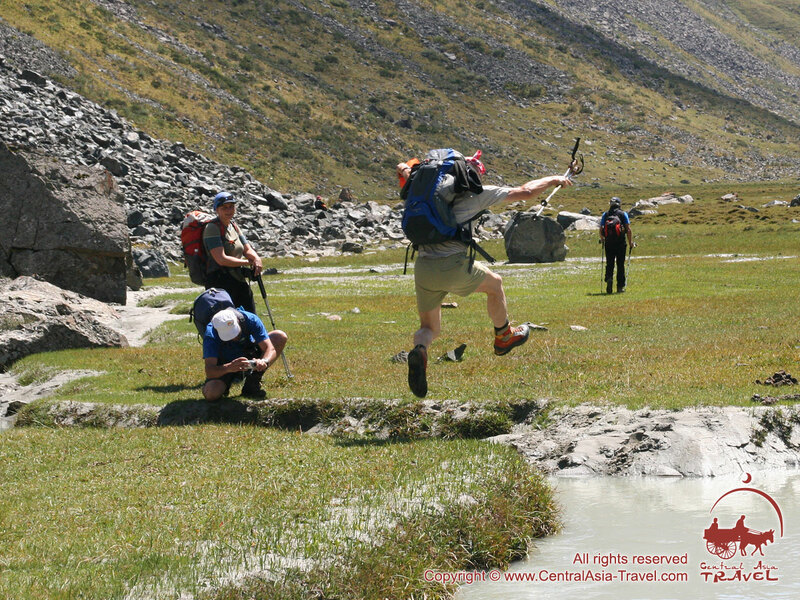 Trekking on foot covers from 5km to 18km a day with altitude difference up to 1600m. 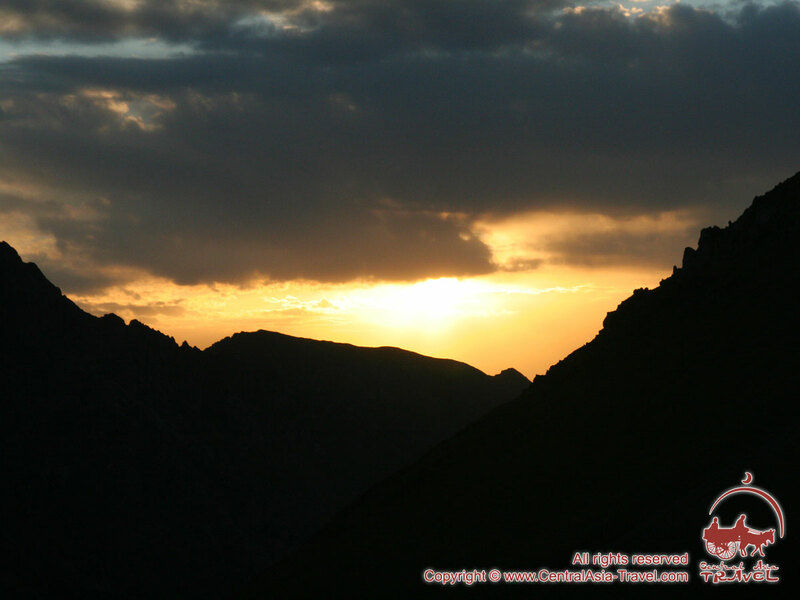 The route runs at the maximum altitude of 3800m above sea level. 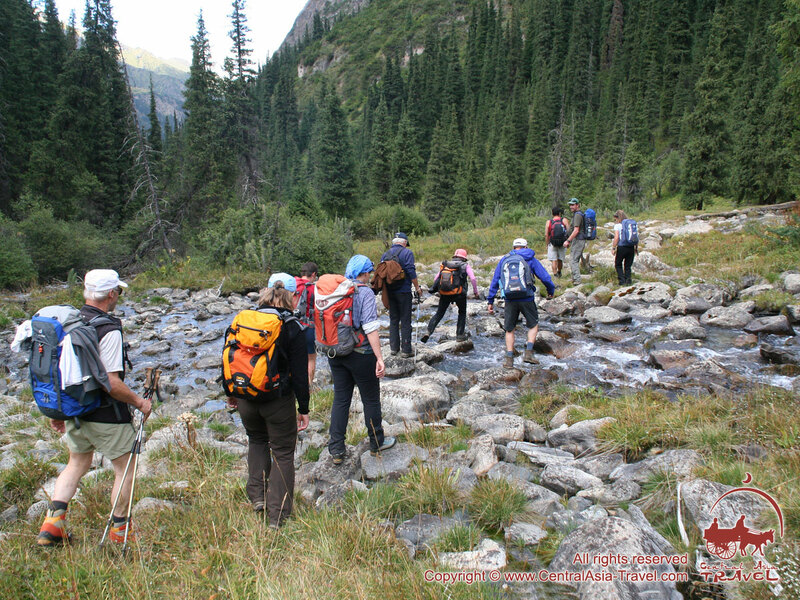 Each participant carries his own rucksack with personal belongings, supply of drinking water and first-aid kit. 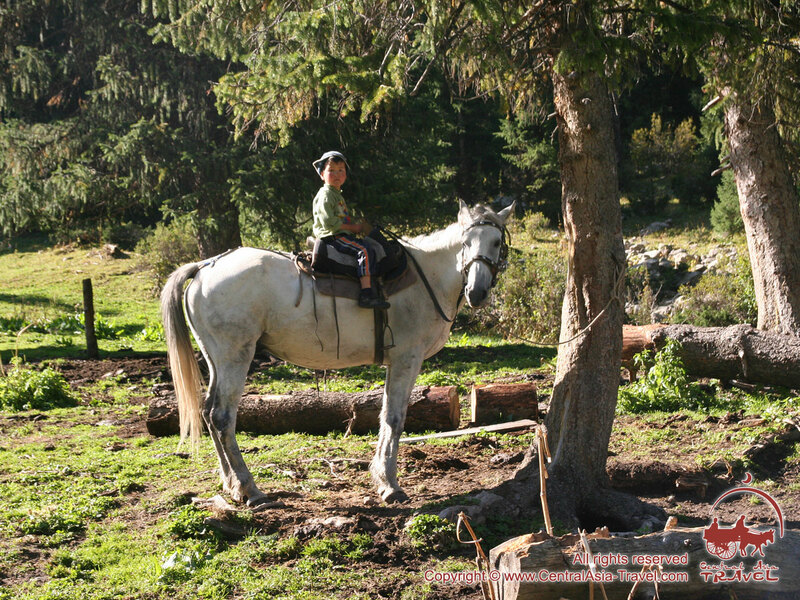 The rest of the gear (the weight of the gear should not exceed 15kg per person), as well as group camping equipment and supply of provisions is transported by pack-horses. Typically the region enjoys rather stable weather: it’s warm and sunny, though some rain is possible, which relieves the monotony of the trip. The daytime temperatures range between +15° to +30°С, whereas at night the temperature can drop as low as +8 or +10°С. The team also includes a dedicated professional cook and porters who is responsible for proper packing of the loads. 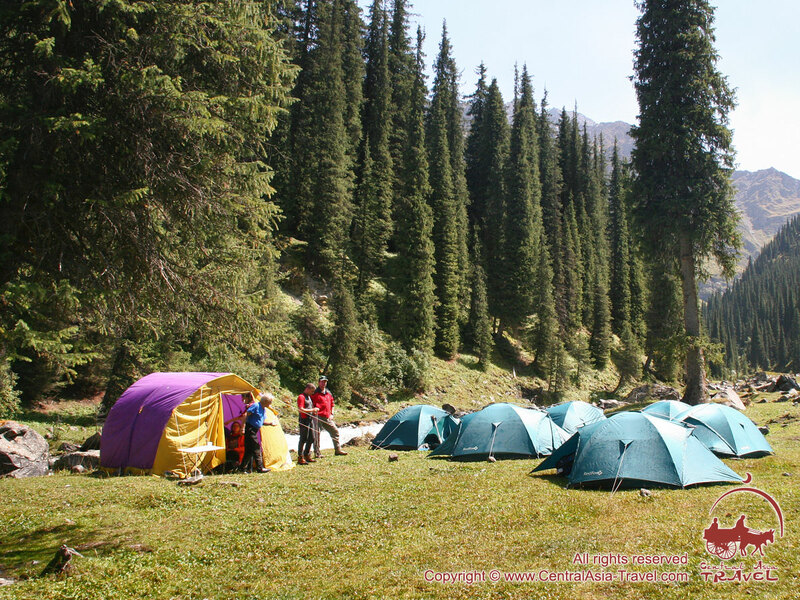 -Tents are used for accommodation of two persons. The tents are wind-resisting and water-proof and are suitable for any weather conditions. For your comfort the tents are equipped with camping mats. 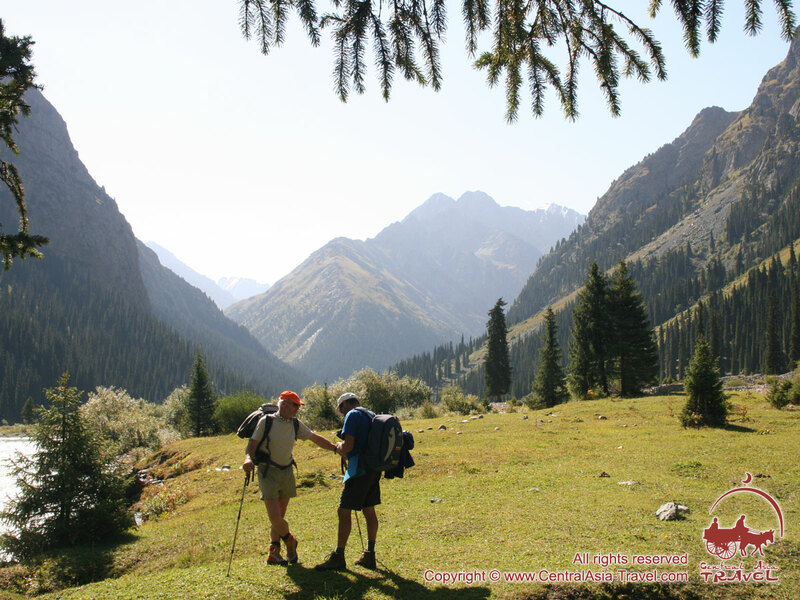 Tourists should arrive to Bishkek - the starting point of the tour on the date the tour begins. All expenses connected with early arrival or late departure on completion of the tour should be covered by tourists themselves. In this case our company can arrange transfers to and from the airport as well as book the hotel. Please note, that the route of the tour runs through mountains with considerable altitude differences (the maximum altitude is 3650m above sea level). 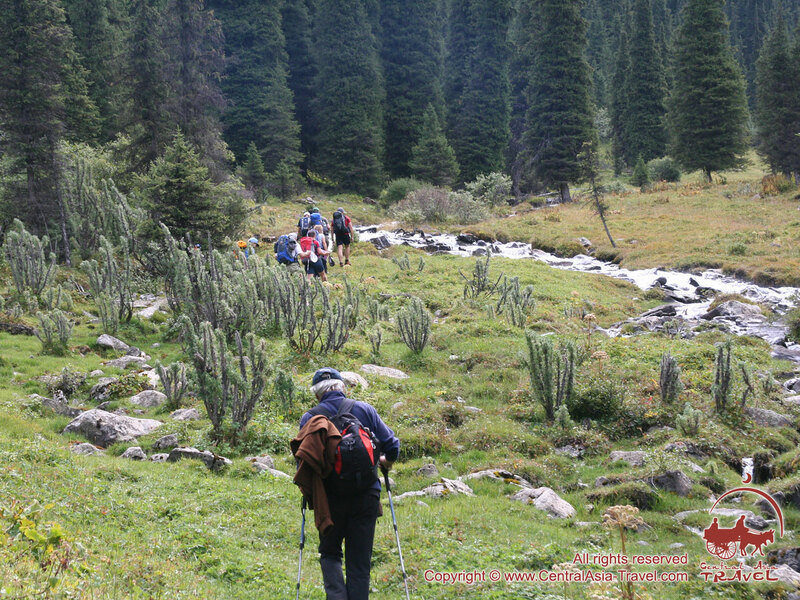 The participants can experience some symptoms of altitude sickness which disappear when the descent from the mountains starts. Therefore the tour may not be suitable for persons suffering from heart or respiratory problems (hypertension, asthma). We recommend you to consult your doctor before planning this tour. In the summer the weather is fair and sunny with daytime temperature reaching +28°С. At night, however, and on rainy days the temperature drops to +8 or +10ºС which makes the availability of warm jacket rather useful. 5. What are the probabilities of encountering some dangerous creatures (besides relatively harmless mosquitoes) such as snakes, spiders, scorpions, mites etc.? 6. Is it allowed to pick up mountain herbs and flowers? Which plants should be avoided? 7. How are meals organized during the trek programme? 8. 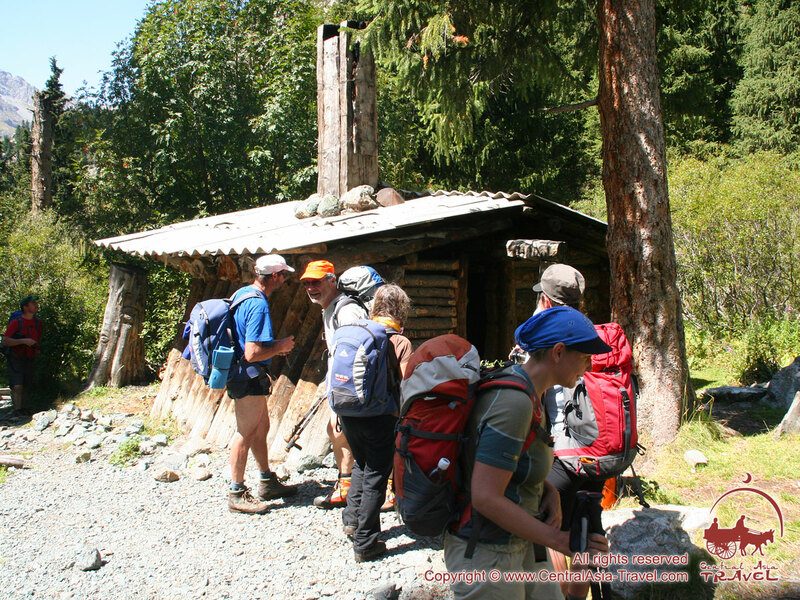 How about communication facilities during trek travel? Cellular telecommunication is available in Bishkek and on the way to valley of Djhety-Oguz river. 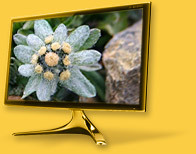 In the mountainous areas, especially in mountain valleys, there are difficulties with signal receipt. Tour manager is equipped with portable satellite terminal to provide uninterrupted external link. 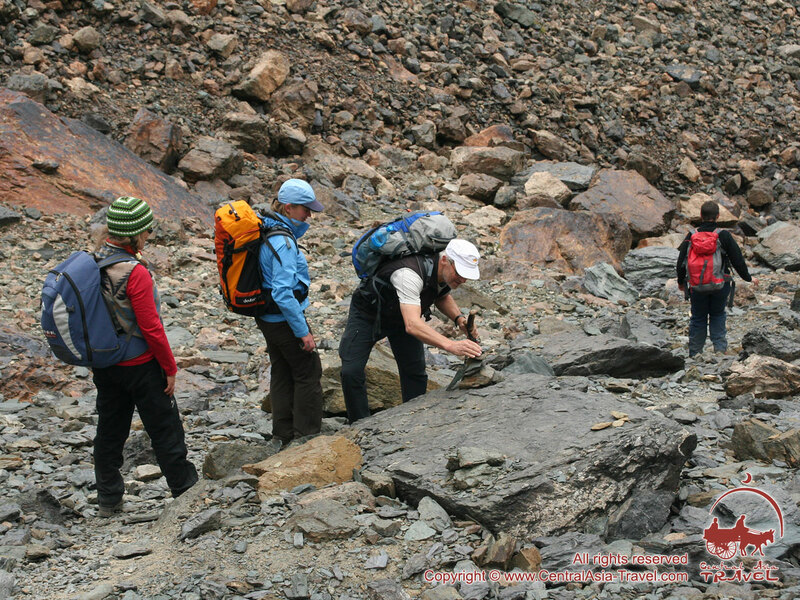 Moreover, the group is provided with walkie-talkie to ensure trouble-free connection between trekkers. 9. How good is Internet access? Internet access is available only in Bishkek and Karakol. There are many internet-cafes there. 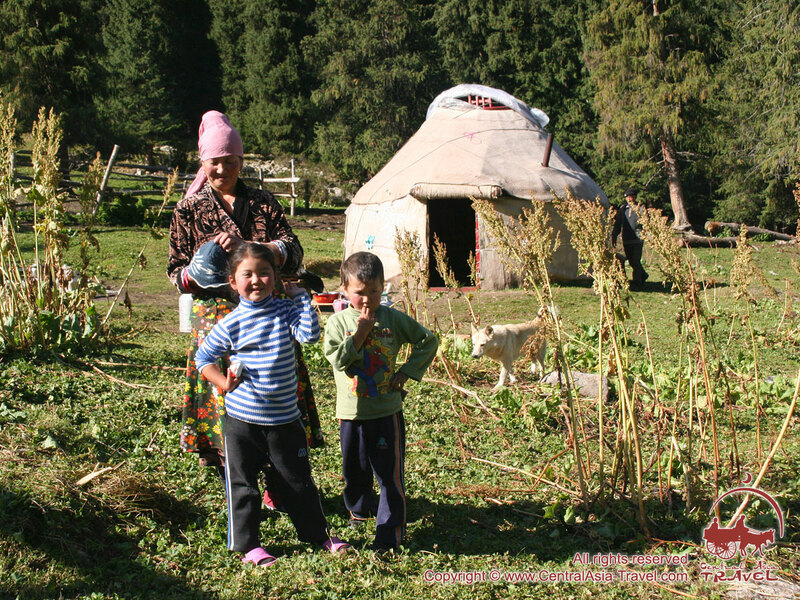 In the valley of Djhety-Oguz river and in the mountains there is no Internet access. In case you can’t find the answer to your question on our site, please call our tour operators team for assistance. The Orient is a delicate thing: fine pattern, delicate silk, fine arts, graceful and charming dances… The tour across Uzbekistan called “The Casket of Oriental Adventures” will guide you through the most interesting places of this wonderful country. 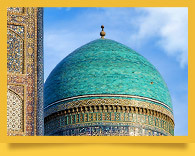 We understand that you wish to manage seeing the most impressive, eye-catching, important and unique things during your short vacation in order to be able to estimate true worth of magnificent monuments of Samarkand, Bukhara and Khiva, in order to be able to enjoy surrounding nature and its generous gifts! Day 1. Osh - Fergana - Margilan (167km). Day 2. 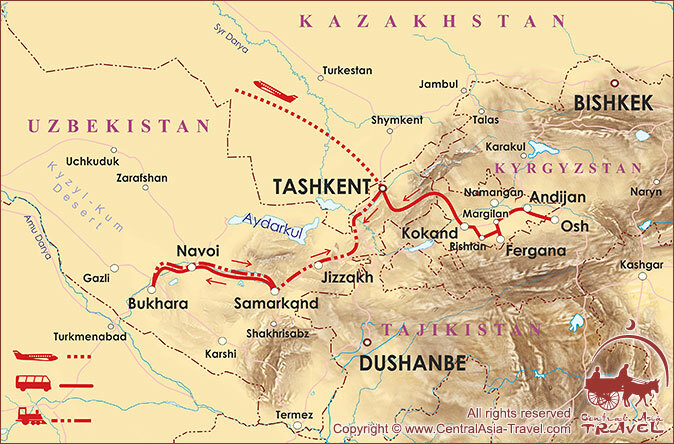 Fergana - Rishtan - Kokand - Tashkent (300km). Day 3. Tashkent - Samarkand (300km). Day 4. Samarkand - Bukhara (280km).